In a campaign marked by skepticism toward the political process, only about half of all registered voters (49%) are “very confident” that their vote will be accurately counted in the upcoming election. This view is particularly striking among supporters of Donald Trump and stands in contrast to the 2004 and 2008 elections, when substantial majorities of voters who backed George W. Bush and John McCain expressed confidence in the count of their votes. Pew Research Center’s new national political survey finds that just 38% of registered voters who support Trump are very confident their vote will be accurately counted. Another 31% say they are somewhat confident, while 30% have little or no confidence their vote will be counted accurately. Among Clinton supporters, 67% have a high degree of confidence that their vote will be counted accurately and 25% are somewhat confident. Just 7% have little or no confidence. The gap between the two camps is about as large among those who express confidence in an accurate vote count nationally. Nearly half of Clinton supporters (49%) and just 11% of Trump supporters are highly confident that votes across the country will be counted accurately. About half of Trump supporters (48%) are very or somewhat confident in an accurate vote count nationally, while 51% say they are not too or not at all confident. By contrast, a 79% majority of Clinton supporters are confident in the accuracy of the nationwide count, compared with just 20% who are not. 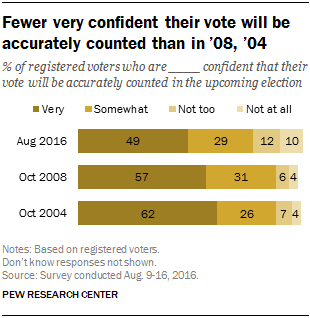 Overall, voters are less confident that their vote will be accurately counted in the upcoming election than they were in 2008 and 2004. In both 2008 (57%) and 2004 (62%), a majority of voters were “very” confident, compared with just under half who feel this way today (49%). There are contrasting trends in confidence among supporters of the major political party’s candidates in these election cycles. For supporters of the Republican candidate, confidence has declined over time. Trump backers’ confidence in vote counting is low: Just 38% are very confident their vote will be counted accurately. In 2004, among George W. Bush’s supporters, nearly twice this share said the same (75%). Similarly, 65% of John McCain’s supporters felt very confident in 2008. 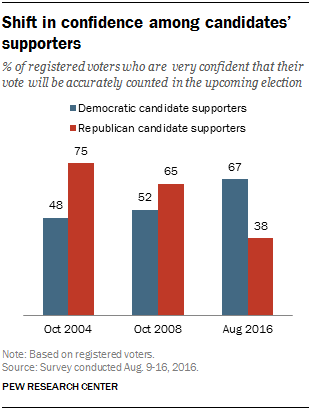 By contrast, among Democratic candidate supporters, the share saying they are very confident their own vote will be counted accurately is significantly higher than in 2008 or 2004. Two-thirds of Clinton supporters are very confident their vote will be accurately counted today, compared with about half of Barack Obama’s supporters in 2008 (52%) and John Kerry’s supporters in 2004 (48%).